Whose Gonzalo Farm is that? A winter’s day at Willows Camp? Did the founding party overnight in McNeill Bay? From the pages of the Colonist, thanks to the University of Victoria Digital Collections’ searchable The British Colonist Online Edition 1858-1920 and to Leona Taylor and Dorothy Mindenhall’s Index to Historical Victoria Newspapers. The Trial Islands were long a mariner’s bane — beset with shoals and reefs in a nasty stretch of water frequented by treacherous tidal rips, combers (long curling waves) and standing waves (formed when wind blows against the current). Trial Islands, nearly 1¾ miles eastward of Clover Point, on the southern side of Enterprise Channel, are two in number, bare and rocky, but generally appear as one. The southern or largest island is 80 feet high, and steep-to at its outer end; the northern one is low, and from it foul ground extends some distance. Strong tide rips prevail off the southern island, especially during the flood, which runs nearly 6 knots at springs just outside it. — The Coast of British Columbia. Compiled by R. C. Ray, U. S. Navy. Washington: Government Printing Office, 1891. @ p. 69. Courtesy Googlebooks. Haro and Rosario Straits, surveyed by Captn. G. H. Richards & The Officers of H. M. S. Plumper, 1858-9, detail showing the waters off Oak Bay. Courtesy Washington State University Libraries Digital Collections. Construction of the Trial Island lighthouse and fog horn in 1906 and the Gonzales Hill wireless station in 1907 had dramatic effects on the incidence of shipwreck hereabouts, if these gleanings — doubtless incomplete — give a true account. The schooner Antelope left on Saturday for Trial Island, to endeavour to save the cargo of the stranded sloop Hamley. Schooner Industry … high and dry on Trial Island … schooner Black Hawk … to her relief. Wreck of a Sloop—Supposed Loss of Life—About noon on Friday Mr Francis, who resides on Trial Island, observed portions of a small vessel floating in the surf near his house, and upon close examination ascertained that they must have formed part of a flat bottomed sloop, painted black with a white streak around her. The mast, broken in two, and shreds of the sails, were picked up. Francis brought word to town and men engaged in coasting express the opinion that the wreck is that of the sloop Annie of Orcas Island, on the way to Victoria, with three men, struck by the sudden squall on Thursday night, and dashed to pieces on Trial Island rocks. A sloop started out yesterday to examine the wreck. Castaway on Trial Island.—Early yesterday afternoon the family of Capt McNeil heard a man’s voice calling from Trial Island, the ugly, weatherbeaten brown hump which lies almost abreast of Oak Bay, , and right in the track of vessels bound for San Juan Island and the Mainland. It is called Trial Island because it tries both human patience and skill to round it when an easterly wind is blowing. They ran down to the beach and saw a man standing on the edge of the hump waving his arms and shouting “Help, help!” The distance to Trial Island from McNeil’s is about a quarter of a mile, a stiff sou’easter was blowing at the time and, besides, there was neither boat nor canoe to be had short of the city. No immediate relief could be send to the poor fellow, who seemed in great distress of mind and body. He explained to the people onshore that he was rowing a small boat and that in attempting to land on Trial Island the boat was stove and floated away, he scrambling ashore. Presently the boat drifted into Oak Bay and was secured. It was full of water and was soon followed by a number of articles that were in it at the time of the accident. Among other things picked up was a pocket book containing memoranda that lead to the belief that the owners name is J Dewilly of Bellingham Bay. Intelligence of the accident reached town in the afternoon and Inspector Bowden, with a crew, started in a boat for Trial Island to rescue the man. Total loss of the Sloop Duncan. And Rescue of The Unfortunate Owner and Family After Twenty-Four Hours Exposure. SS Enterprise southbound in Haro Strait from New Westminster collided with R.P. Rithet, northbound for New Westminster … at 2:25 p.m.
Aug 1, p. 3; Inquest: Aug 5, p. 3; Aug 6, p. 2; Aug 7, p. 3; Aug 8, p. 3; Aug 9, pp. 2, 3; Aug 11, p. 3; Aug 12, p. 3. “Wreck of the SS Enterprise off Ten Mile Point near Victoria.” Photograph by Maynard, July 1885. BC Archives Call No. A-00070. Courtesy Royal British Columbia Museum Corporation. … total wreck, abandoned. Her back is broken and her position is perilous in the extreme. The captain and crew, with the rigging and moveable effects of the wreck were brought into port on Sunday. Mr. Charles Burns, owner of the sloop that went ashore near Trial Island last Friday night with a cargo of hoops for the Saanich Lime Company, has returned to San Juan by way of Port Townsend, and will leave San Juan at once with another sloop to try and release his own from the rocks at Fowl Bay. 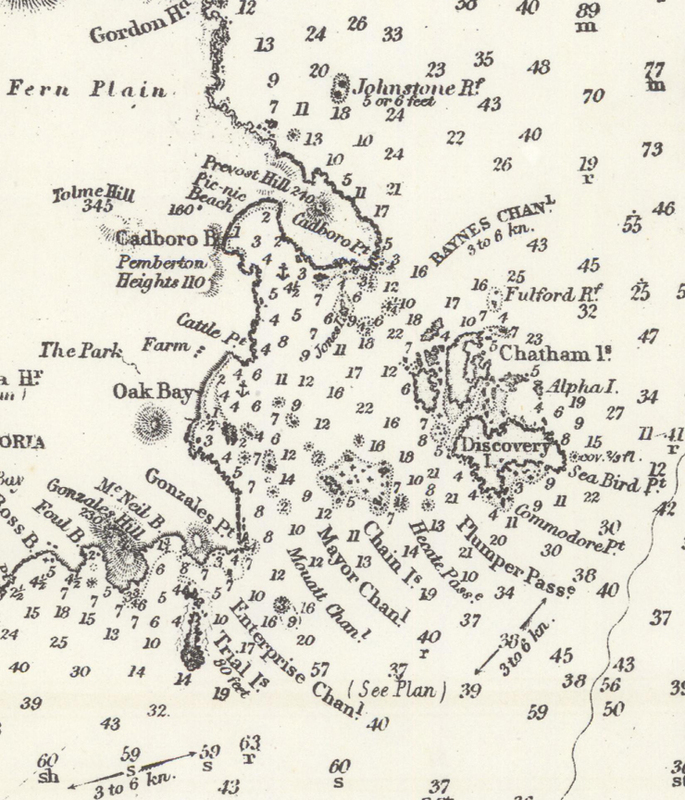 Emma went ashore on … Mellon’s Reef, in Sunday night’s fog … two coal scows in tow … appears to be a total wreck. .. The C. P. N. Company’s steamer Maude was yesterday on the beach at McNeill Bay. She left here for Nanaimo on Friday evening, and when off the bay the wheel chains broke, leaving her helpless for the time being. Realizing what had happened, Captain Roberts immediately dropped both anchors, but the heavy gale took the steamer into shore in spite of all efforts. The tug Mystery yesterday went out, but was unable to pull the large steamer off the beach, where she was found partly on her stern, with her rudder badly crippled. The Islander went to her assistance last evening. The Tug “Hope” Comes to Grief In Oak Bay. Late in the day [of March 22] the tugboat Velos towed the converted hull of the tug Pilot with twenty-four men aboard out of Victoria Harbour and into the teeth of a vicious southeaster. Aboard the Velos, bound for Haddington Island quarries, was stonemason Frederick Adams, 55, owner of the Pilot. He had signed his will only that morning. A desperate man, he had overridden the skipper’s advice not to go out. 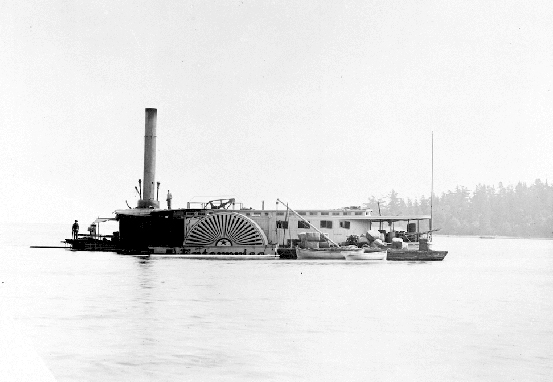 Adams had been the second-phase contractor for the B.C. Parliament Buildings until he got into a fight with architect Francis Rattenbury about dark stone secured from a quarry in Koksilah for the buildings’ façade. Rattenbury had chosen the darker rock, but onsite changed his mind, then hung the mistake on Adams. It had to be replaced with lighter-toned rock, Rattenbury insisted, at the contractor’s expense. Rattenbury, a newcomer from England half Adams’s age, had with a padded résumé and borrowed designs bested sixty-six competitors in the competition to design the new Parliament Buildings. He was a star in Victoria. Adams lost the blame game and had to withdraw from the contract. The ex-contractor found himself scrabbling to deliver the replacement materials at his own expense. Rattenbury thought nothing of charging B.C. taxpayers $3,000 for attending many acrimonious meetings over the affair. Parts of Frederick Adams’s story are in Rattenbury by Terry Reksten (Sono Nis 1978, 2nd edition 1998), Francis Rattenbury and British Columbia: Architecture and Challenge in the Imperial Age by Anthony Barrett and R. W. Liscombe (UBC Press 1983), Keepers of the Light by Donald Graham (Harbour Publishing 1985) and The Daily Colonist. Adapted from Victoria from Sidney to Sooke, An Altitude SuperGuide by Peter Grant (Canmore, Alberta: Altitude Publishing, 1994). … swinging easily … hanging with her stern almost in the path of coasters, in fog so dense the shoreline could not be made out through it. On a Reef for Six Hours. Str. Princess Louise Runs on the Edge of Mouatt Reef Yesterday. … Purser went ashore … some passengers … landed on rocks at Gonzales Point … walked to Oak Bay, ¼ mile … street car to city. … Capt Sears went to Charmer … made report to Capt Troup … Otter standing by … Queen City … Princess Louise floated off with the tide about 11 p.m. The Santa Clara (Alaska Packer’s Association) was with the Benjamin Packard and Bankburn, lying at anchor in the Royal Roads on the night of Christmas, and when the wind blew “great guns” and did so much damage, she drifted to within a couple of ship’s lengths off Trial Island, where her anchors held. The Bankburn drifted across to San Juan [Island?] and the Benjamin Packard to a stone’s throw from the reefs off the Dallas road [sic] inside Brotchie Ledge. The Santa Clara was kept from going ashore by most skilful seamanship, and next morning she was riding to an anchor off Trial Island. When the Mystery came to her assistance she lifted her anchors and the heavy westerly wind set her on the rocks. January 11, p. 3. Re-edited. “View of Santa Clara at Fourth Avenue dock in Seward, Alaska.” Stauter-Mongin Photograph Collection, 1905-1915, Identifier SCL-4-5, Seward Community Library Association. … was floated at 6.30 yesterday morning. … The holes made in the port side of her by the pounding on the rocks were temporarily repaired, and then 18 of Stevedore McDermott’s ‘longshore crew took out 300 tons of her ballast, the work being completed on Thursday night. The yards, top hamper, pumps, etc. had been lightened … and a ten-inch pump belonging to the British Columbia salvage association had been placed on board to keep the ship free of water. At high tide yesterday morning the water lifted her from the rocks and the tugs Mamie and Tyee—the little Tyee—hauled her into deep water. She … will be hauled out on the Esquimalt Marine Ways. She is not seriously damaged and will soon be on her way up to load cargo at Ladysmith. Sunday’s Gale Wrecked ‘Small Craft Near Stranded Santa Clara. During the storm of Sunday a sloop was wrecked near the Santa Clara. T. Carlesen, the Swede, against whom charges of selling whiskey to Indians on the West Coast have been made, is said to have returned from the island coast on Saturday, and a suspicion was entertained that it was his sloop that was wrecked, but this fact has not been proven, nor the sloop identified. The occupant of the wrecked sloop was a Swede, but it is not known whether he is the man for whom the police are looking. The Swede was bound to Port Townsend in his vessel, which is a fishing boat about 18 or 20 feet long, and was sailing on the weather side of Trial Island when the storm arose. He sailed around afterwards to the leeward side of the island and was driven in near the Santa Clara by the wind . Seeing him in danger some sailors gave him a line, and he went on board the ship. He had a trunk in the sloop and the sailors asked him to send that up on the Santa Clara, but the man refused, and while he stood on the ship in conversation in this regard, a wave swept the sloop up against the ship, swamped her and the trunk was thrown overboard. It broke open and a number of small boxes fell out. As the trunk was swept overboard the rescued man said, “Well, I guess I don’t go to Port Townsend.” The sloop was wrecked. A craft believed to be the same vessel was picked up yesterday in McNeill’s Bay, where it had been drifted by the tide. The boat was badly split, the injuries, seeming, newly received. The mast and sail had carried away, and the rudder was gone. The boat had a blue top and was painted brown inside and dark brown outside. It was picked up by Mr. Sewell. Santa Clara has been hauled out on the Esquimalt marine ways, and it is now shown that her injuries were greater than expected. The greater part of her keel has been torn away or wrecked, her starboard bow is injured, and many timbers and frames will have to be renewed on her port side, where the rocks sprung in the timbers as she fell over at low water. There are no large holes in the ship’s hull, as the rocks did not penetrate, but sprung the timbers and knees. The work will employ a number of shipwrights for the best part of a month. The case of the Alaska Packers’ Association vs. S. A. Spencer is now occupying the attention of the full court in Vancouver. It is an appeal against the judgment of Mr. Justice Irving. E. V. Bodwell, K.C., is counsel for the appellant, and K. P. Davis, K.C., and Mr. Wilson, of Victoria, are acting for the defendant respondents. The story of the case is as follows: On December 23, 1901, the Santa Clara, Captain Lindburg, was lying at anchor in the Royal Roads, off Victoria, where she was overtaken by a heavy gale, and after dragging her anchors for some distance the ship came to a safe anchorage in a little bay near Trial Island, in the straits of Juan de Fuca. 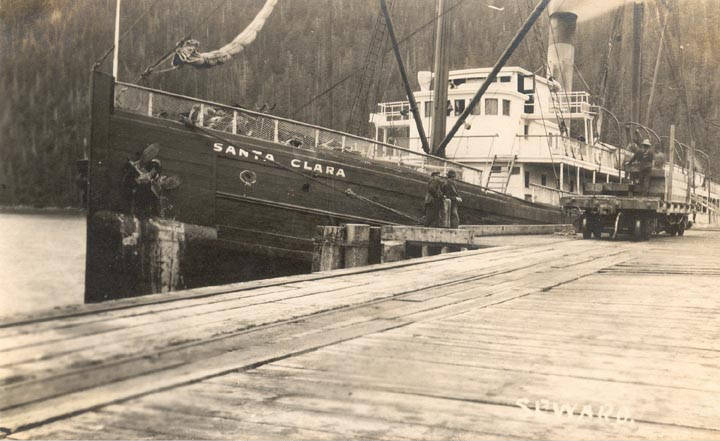 On the following day she was approached by the tug Mystery and an arrangement was made to the effect that the latter should tow the Santa Clara to her destination, at Ladysmith, Vancouver Island. Accordingly a hawser was thrown the Santa Clara and made fast, and then the complications which resulted in the Santa Clara drifting on the nearby rocks arose. The plaintiff appellants claim that the engines and equipment of the tug were not capable of towing the Santa Clara, and taking her straight ahead, and so, by lack of power and bad management the ship was allowed to drift backward on the rocks on the shore of Trial island, with the result of damage to the ship and loss of time, which the plaintiffs estimated at $25,000. “Alaska Packers vs. J. A. Spencer. Law-Suit Hinging on a Marine Accident During Storm of 1901.” Colonist, April 23, 1904, p. 8. … Among the vessels stranded on Trial Island were the steamer Tees and the ship Santa Clara, which drifted on to the rocks on the opposite side of the island after dragging her anchors during a heavy gale of Christmas night, 1901. The tug Mystery which was to have towed her off was considered responsible by the Alaska Packers’ association, owners of the Santa Clara, they claiming the vessel lifted her anchor and went ashore because of the negligence of the tug. Several costly trials were held in consequence, in which the suit brought against the tug was dismissed. “City of Seattle Fast on Rocks.” Colonist, September 21, 1906, p. 7. The Daily Colonist, January 10, 1904, p. 1. Accessed via The British Colonist Online Edition 1858-1910 <http://www.britishcolonist.ca/>. In gale-force southwesterly winds the brand-new Seattle-based ferry SS Clallam flooded and lost power in the tidal rips south of Trial Island en route from Port Townsend to Victoria. Three lifeboats full of passengers, put into wild seas in an area notorious for tidal rips, were lost during or minutes after launch. All the women and children aboard perished. Some had begged not to be put off the steamer. A man committed suicide after watching his wife and child drown. Then the steamer stayed afloat for ten hours. It sank after being towed — back toward Port Townsend, for a reason never explained — then suddenly cut loose. Many died after falling off the sinking steamer. A few male passengers and 22 remaining (mostly American) crewmen survived, while more than 56 people died. Why? The contributing neglects and mistakes were many and various; it was never even made clear how the ship became flooded. Human error played a huge role — but whose, and how much? 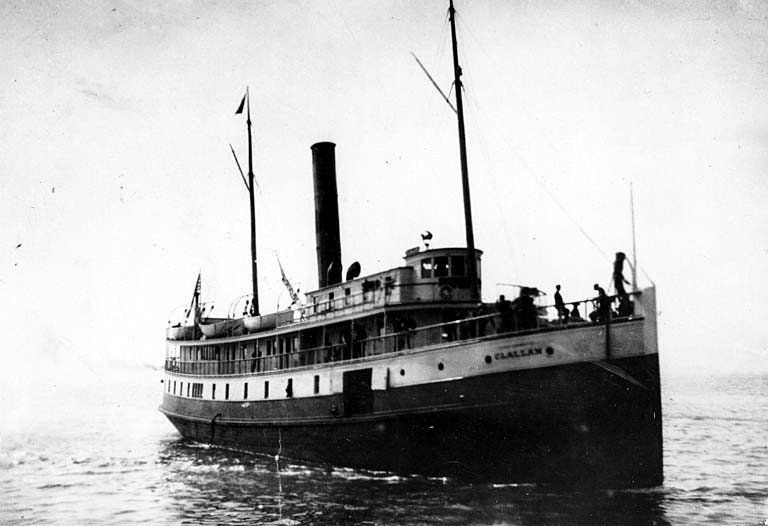 SS Clallam. University of Washington Libraries, Special Collections, UW10684. Used by kind permission. January 10, 12, 13, 14, 15, 16, 17, 19, 20, 21, 22, 23, 24, 26, 30, February 3, 4, 6, 10, 12, 13, 14, 16, 17, 18, 19, 20, 24, March 8, 15, 16, April 10, 16, 22, June 15, July 20, August 11, 13, 17, September 22. 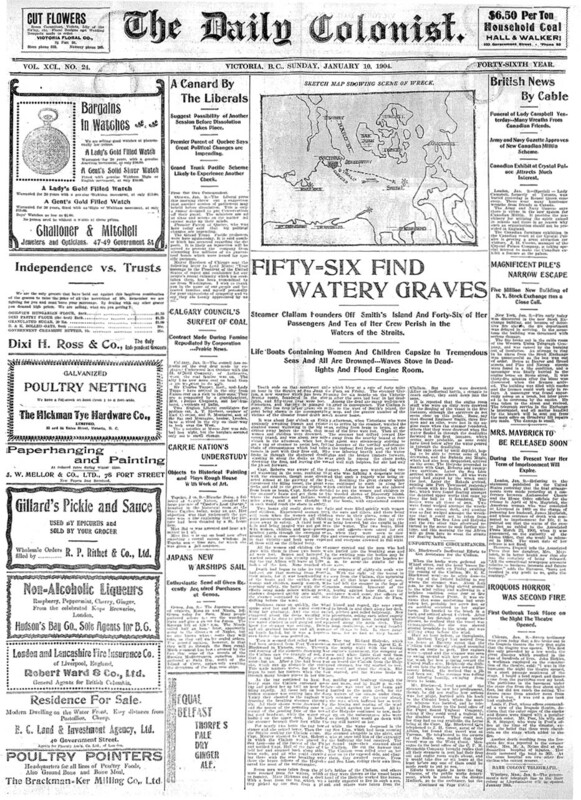 Thanks to CanGenWeb’s British Columbia website <http://www.rootsweb.ancestry.com/~canbc/clallam/clallam.htm> for compiling transcriptions of press coverage. Canadian outrage was articulated poetically by Frank Davey in The Clallam, or Old Glory in Juan de Fuca (Vancouver, BC: Talonbooks, 1973). 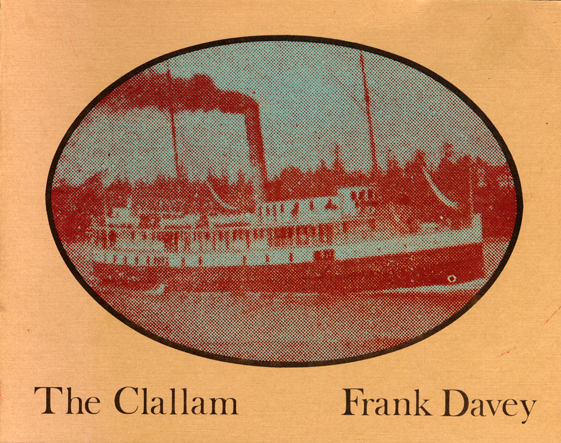 Cover of The Clallam or Old Glory in Juan de Fuca, by Frank Davey. … hundreds of Victorians visited the Olympian Boulevard, which runs past the golf links and affords a magnificent view of Trial Island and the straits, and had a look at the stranded steamer as she lay at low water perched upon the reefs. At Trial Island. Details of Arrangement of the Fog Alarm and Light Station. 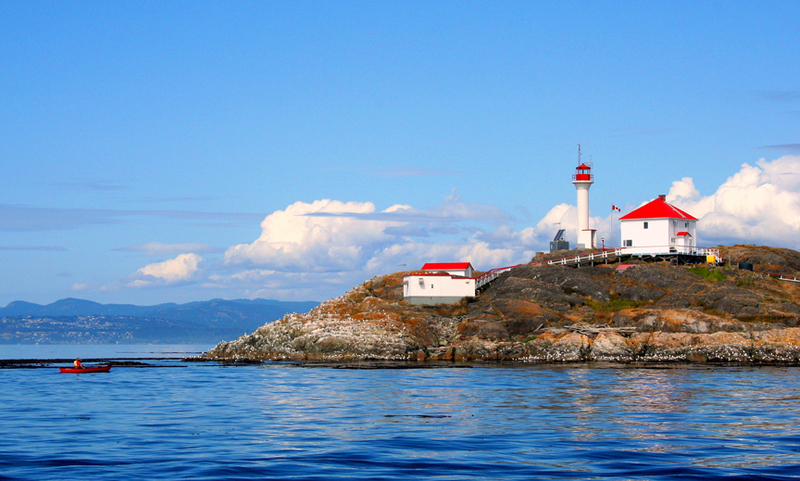 … notice: “The lighthouse is built on the summit of the 80-foot knoll near the southwest end of the island. The fog alarm building stands on a lower part of the rock southeasterly from the lighthouse. It is a rectangular wooden building, painted white with red roof. The horn projects from the south end of the building, and points. 22º E. Lat. N. 48º 23’ 39”, Long. W. 123º 18’ 48”. Trial Island from the southeast, showing the lighthouse (built 1970 on the site of the 1906 liighthouse), the lightkeeper’s residence, at right, and the fog horn housing, at left. Photo by lighthouser, on flickr. Used by kind permission. … three men went ashore to telephone regarding the accident from Oak Bay hotel. October 17, pp. 1, 5, 8. 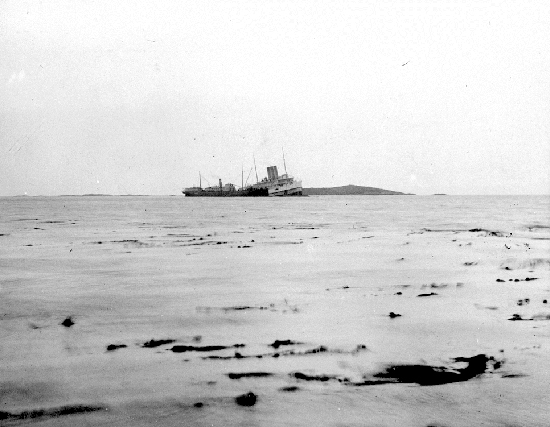 “The SS Princess Victoria aground on Lewis Rock.” Photographer undetermined, taken 16 Oct 1906. BC Archives Call No. C-09834. Courtesy Royal British Columbia Museum Corporation. Salvage of Launch Involves the Owner. Customs Officers Want to Know Why He Failed to Report Arrival of Vessel. The salvage of a gasoline launch belonging to Dr. Capron of Roche Harbor is liable to involve the owner with the local customs. It seems that during the blow on Wednesday the launch which had been anchored at Oak Bay dragged her mudhook and was on a reef off the Oak Bay hotel when G. L. Woods, master and owner of the sloop Marion, noticed the danger of the launch. He went out with a boat and with a kedge anchor thrown out some distance from the reef dragged the launch to safety. It was still blowing heavily and the launch was with difficulty kept from again drifting to a reef. For three hours Mr. Woods and H. Hawkins from the Oak Bay hotel worked to salve the launch and succeeded in beaching it. The salvors yesterday morning notified the collector of customs, J. C. Neubury, of having rescued the launch and to the effect that they considered themselves entitled to salvage therefor. Meanwhile they have pasted their label on the vessel to notify the owner that they have made have made claim for salvage. The notice of the claim by the salvors was the first intimation that the customs had of the existence of the steam launch. Consequently, the customs officials are awaiting for the owner to make his appearance and explain as to how she came to be anchored unattended off Oak Bay without having been reported to the customs house. It is stated that the vessel, an American launch, is owned by Dr. Capron, of Roche Harbor, who occasionally visits Victoria and Seattle, and when bound to the sound city he comes via Victoria making the voyage from Roche Harbor to Oak Bay in his launch which is left at Oak Bay while he journeys from here to Seattle and back. Wireless messages are now being exchanged between the government stations at Shotbolt’s [Gonzales] hill in this city, where E. J. Haughton is in charge, and Point Grey. It was agreed that the letter “V” should be sent over at 10 a.m. At first the sound came very faintly, but when the instrument had been turned up it sounded strong and clear. The distance between the two stations is seventy three miles, and it was feared that the high islands between would interfere with the transmission of the ether waves, but these troubles are far less than was anticipated. When the first message was received, a reply was immediately sent by wireless to Victoria, and the tidings were also sent by wire to Colonel Gourdeau, Deputy Minister of marine and Fisheries at Ottawa. After this, messages totaling two thousand words were exchanged between the two stations. The speed at which the messages were sent exceeded thirty words a minute, which would be considered good work, even by wire. Colonist, November 30. From Marine Wireless History on the West Coast of Canada 1900-1959 transcriptions of news articles. Rough Radio, http://www.roughradio.ca. 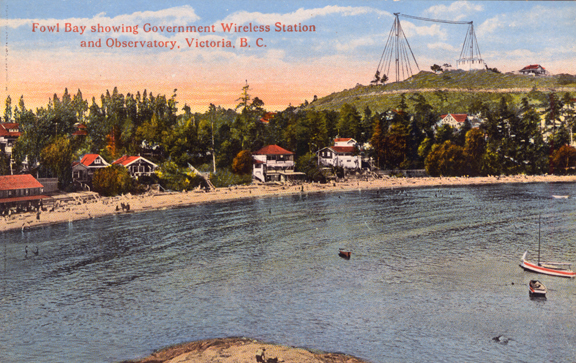 “Fowl Bay showing Government Wireless Station and Observatory, Victoria, B. C.” Lithographed postcard, taken 1913 (when the Dominion Meteorological Observatory was built) or after. Author’s collection. The Gonzales Hill wireless station was built in 1907, with a 55-metre (180-foot) tower to which the second was later connected. The station itself was north of the observatory site. Sometime in the 1940s the station was demolished. 6 Victoria Men Drown in Gale. Only One Crew Member Survives. Six Victoria seamen drowned when the 72-foot tug George McGregor capsized off Trial Islands at 5 a.m. today. Only one crewman survived the bitter ordeal in the freezing water southeast of Victoria in this morning’s storm. The six men dropped one by one from an overturned lifeboat in a night of horror that once saw them within five yards of safety. Captain John Mason, Lampson Street, Esquimalt. A. Johannsen, Calumet Ave., chief engineer. Leo Dobinson, 309 Montreal Street, second engineer. Bill Hunter, Tod Inlet, mate. A. Matthews, 2643 Blanshard Street, cook. A story of mountainous waves that capsized first the tug, then the lifeboat and plucked the six men to their doom was related today by Gerald Douglas Anderson, 17-year-old deckhand, the single survivor of the tragedy. Anderson was in bed suffering from shock when The Vancouver Sun telephoned his home today. “It was like a nightmare,” he said. “Two of the men rushed on deck almost naked when the McGregor started to go. They had been sleeping when the tug began to turn over. Anderson reached shore totally exhausted and half-frozen after clinging stubbornly to the lifeboat for 3½ hours. “I tried to use a paddle but it was all I could do to hang on,” he related. He said there was just time to launch the boat as “monstrous seas” tossed the foundering tug like a cork. The survivors wept as they watched their companions slip off, one by one, from the lifeboat and sink unconscious into the water. The George McGregor was inbound to Victoria from Bamberton, on Saanich Arm, where they had left a tow. The vessel was operated by Victoria Tug Co. Ltd. The tragedy apparently took place so quickly no one had time to send a distress message on the radio-telephone. Word was first received through an anonymous telephone call to the company. The Vancouver Sun, November 26, 1949, p. 1. I cant find your email address on my home computer. Love your new postings. I recently posted your Chronicles on my Facebook page and sent it along to the Friends of Trial Island Lighthouse. Please check out the Friends Facebook site and add some history if you have a chance. Pte. Robert Burt Gilbert - BC Black History Awareness Society on A winter’s day at Willows Camp?